It is with great pleasure I can announce that one of my group photographs inspired by Norman Lindsay's gorgeous fanciful work has been shortlisted and hung at this years Head On Portrait Prize. It has been selected out of a pool of over 5000 entries, and I must say I am pleased. I can remember seeing earlier versions of this show, when it used to accompany the Archibald Portrait Prize and was held in the basement of the Art Gallery of NSW. I remember one year a portrait of Reg Mombasa took my breath away. Another was one of Paul Kelly. Head On is an off shoot of this competition when it was found homeless. A rather disappointing decision at the art gallery. I have no idea of the politics at the time, but photography was probably not seen as one of the fine arts. A bit like the year a drawing won the painting prize. The Head On Photo Festival grows substantially each year. Sydney comes alive with photography exhibitions, talks and workshops. There is so much on it is overwhelming to try and see every show. This will be my forth time I have been apart of the Head On Photography Festival. The first was with Christine and a collaborative show we put on in 2011 called You + Me = LOVE at Ambo Ars in Newtown. The second show was a collection of nudes I curated and exhibited in 2013 at the Mercure Hotel in Pots Point, this included my own personal work as well. ‘Naked Lens’ was an outstanding exhibition and was incredibly satisfying to curate. The third exhibition was also a collaborative exhibition at Gallery 188 in Katoomba in 2016 called 3 + 1, where three photographers (Edmond, Chris and myself) exhibited works created with the same model, taken on the same day on the same photoshoot. This was the first exhibition that I printed my work at its intended size. Steam Punk Circus was a collaboration. It wouldn’t have come together without the efforts of Emma, whom took up my idea of a group photograph in Adelaide. She ran with it, proposed an idea and managed to get all of these people together in themed costumes for an afternoon. It was my sixth large group portrait. Each one becomes an intense learning experience, a journey of discovery in figuring out what works and what doesn’t. The first one was most of the entire town of Gulgong as part of its centenary celebrations. My biggest mistake was not managing the media, for the local press took a similar shot and sold if for ten dollars a print through the Mudgee newspaper. For all my efforts I sold three prints for a photograph with hundreds of people in it. One hangs in one of the many pubs, another was in a grocery store and the third was in Jules’ bookshop. When I do these shoots we do three poses. The first one is usually stiff, the second one people start to relax. Everyone rearranges for each. The third usually nails it. Three, yes three. Six sheets of film (two shots of each of the poses). Months of planning, days of preparing, experimenting, stillness for a few seconds and it’s over. 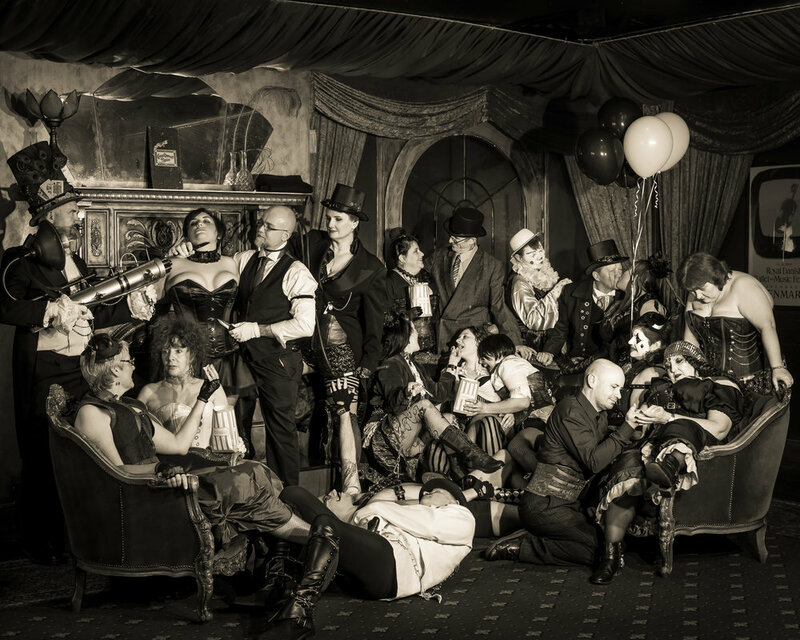 We created Steam Punk Circus in a pub, the backdrop was how we found it. Each person took on a character dressed and acted thier part. An amazing experience that I am so thankful for all of those that helped make it. Not something that can be done alone. Collaborations are amazing. I could be excused for thinking this is just another of my many beautiful photographs. Weeping Rock on Jamison Creek, along Charles Darwin Walk, is an incredibly popular tourist location. Here, in good water after rain, the soft veil of water creates a gorgeous curtain of movement and velvet softness. Thick mist cradles the moment. I once lived very close to this spot during my son’s first year. I would walk up the creek to get to work. I have wonderful memories of my sister's place directly above it. We would wander down when I was nine to this creek to play. Goats in the yard and a house so large you could ride a bike in it. Every time I wander past that house I stop and stare at it and try to remember. This is a very special place full of so many memories. I could go on and on. However, despite all of those wonderful times, this photograph holds a new special meaning. One not just for me, but for another. This photograph started a conversation. A very special conversation about art. One that grows and blossoms. It marks the very moment something started. Something so grand and so magical. Yes, you can look forward to hearing more. Over the last few days I have been reminded of my time with Adventure Education. 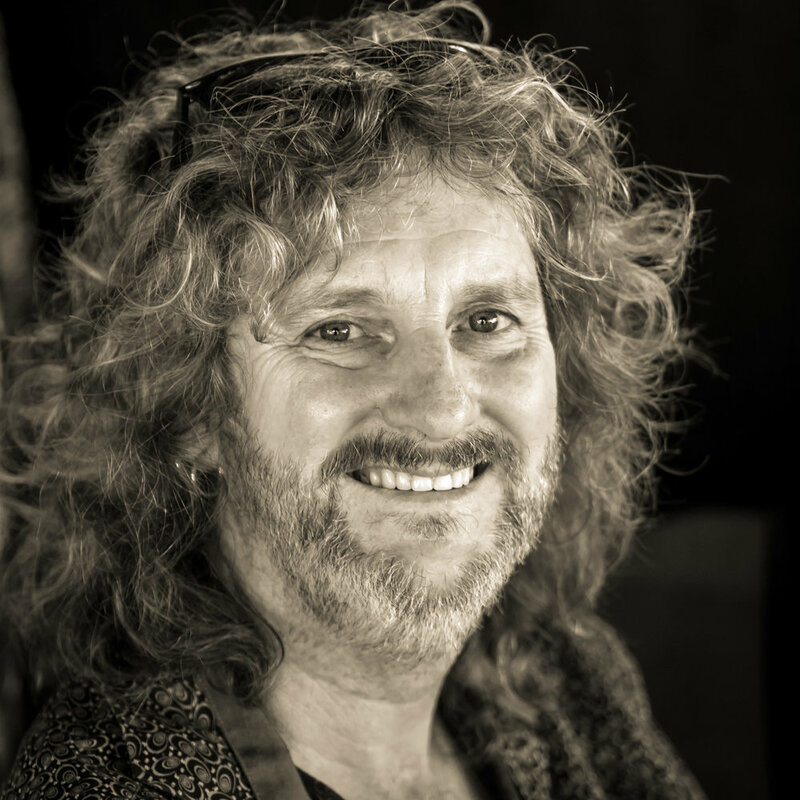 Nearly thirty years ago, I was a business partner in this outdoor education company that specialised in experiential education programs for schools. There are so many stories to tell around my time as a director. Young and full of energy, I ran the business and worked in a kids' refuge as a direct care worker to pay the bills on my days off. I would leave one job to do a night shift and go back again. I wouldn’t mind some of that energy now. SCECGS Redlands became our biggest client. My job was to design, cost and run the outdoor program for the entire school. It would start with the primary school kids, taking them to the park to chase grasshoppers and start the introduction to our program of environmental and social education. Each year the kids progressed into a more intensive program. Some years were heavily set in environmental field study centres, like Yarrahapinni. Other years were very community based where we taught interpersonal skills. Their final year saw us teaching leadership skills just before they started their HSC. This was all tied together with outdoor adventures. Bushwalking, camping, canoeing and the usual mix of activities at height, such as high ropes, rockclimbing and abseiling. The finale saw the near university-ready students design and run their own outdoor program. Something I facilitated personally, teaching and helping the students put together their own trip. It was a massive program. 200 kids per group. We occasionally needed forty to fifty staff to run a year group. The food used to arrive by the truckfull. One of the many highlights of that program was spending a few days with the headmaster from the Peter Cornish School, as we visited the kids in their campsites in the bush. He said to me “Len, you are to be commended, for you have changed the culture of the school.” In a very short space of time the school had become more caring and community based. If we could change a huge school's attitude in a year or two, it is possible to change one person's.